the other day i took a train up to Liverpool* to see Rene Magritte – a huge show of painting plus some of his commercial graphic work and some films. A brilliant and inspiring show. Magritte is the best of the Surrealists. His work really explores Freud’s idea of The Uncanny. Ordinary things in extraordinary situations: an apple big enough to occupy a room; a sinister lamp lit street under a bright blue cloudy sky; a man stands under a glowing streetlamp – in the middle of his living room, a sky rains down neatly-dressed bourgeois gentlemen onto a sedate townscape. 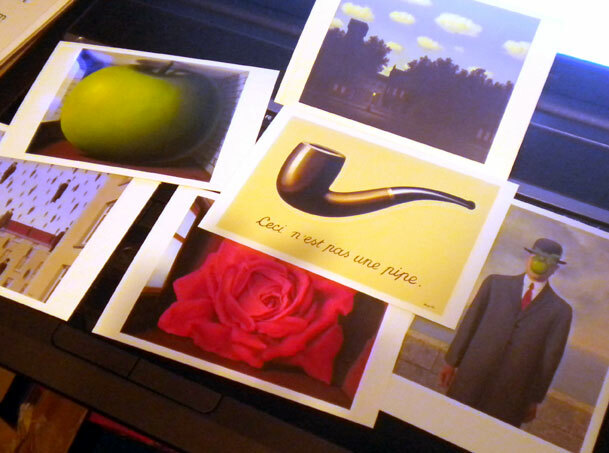 Having seen Magritte’s work in ones and two in museums around the world I always found them amusing, clever, witty. Seeing them all together though I found them creepy, unsettling, mind-expanding. Haunting, but not in a Gothic way. Weird, but not twisted, in a Dali way. Unsettling but not flamboyant like the work of Ernst (whom I do love, but not as much as this). A few months a go I was lucky enough to see Surviving Life by the great Jan Svankmajer. I said it was pure and perfect surrealism. It is. And so is Magritte. Nothing else comes close to these two. * just wanted to mention that the train was very fast and made me really sick! I thought I was going to vom. The effect stayed with me hours afterwards. Horrible. Was it just me?